Every new television technology comes with an age-old problem: How to sell the new advances when the majority of consumers have sets that can’t demonstrate the improvements. 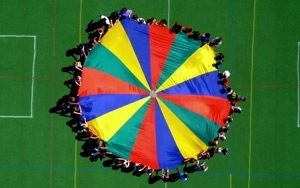 A trailer for the film uses unique imagery from above to create a sense of universality of growing up around the world. The trailer begins with a girl dumping marbles across a tile floor amid a collage of voices saying “growing up.” Amid images of children playing, kids explain — off camera — how they view growing up. “Your body changes; you get bigger,” says one. As the activities mature (skateboarding, getting married), a man describes the sense of impatience many feel when it comes to growing up. “I want to drive. I want to drink. I want to move out,” he says. “I feel it takes your whole life to become young.” The trailer explains the film is “A Vizio documentary,” and highlights the brand’s work with digital production house Everdream, before closing on a father working with his child on learning to crawl. It’s unclear where the film might be shown after the SXSW festival, although Knowles noted that the trailer can be viewed on the brand’s Web site.